Before you read any further - if you have not read yesterday's post, you must read it now. The backstory of the mistake I made with the pretzel bites, is imperative for you to know before you read on. If you have already read it thank you for being a loyal reader. You are the cheese to my macaroni. 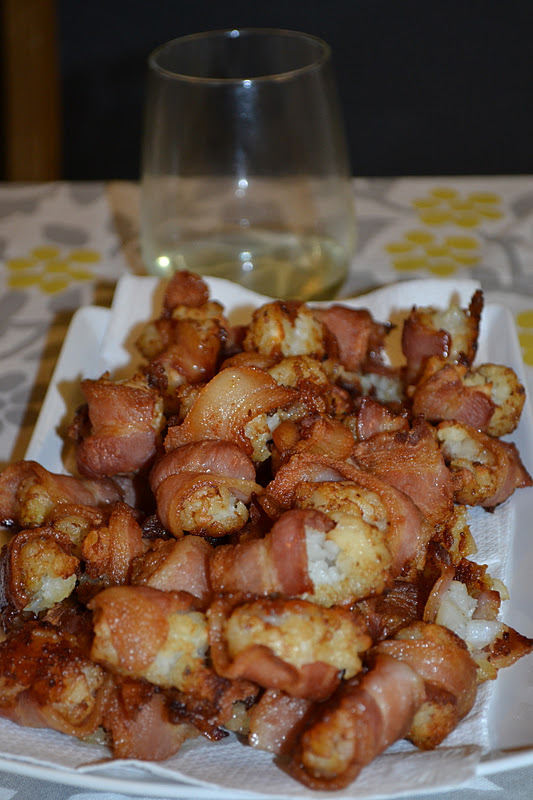 Now that we're all caught up, the other fun snack I made for GB's UFC fight party is what I'd like to call Bacon Wrapped Heaven. A long while back I saw this photo somewhere on the world wide web. Your eyes do not deceive you. 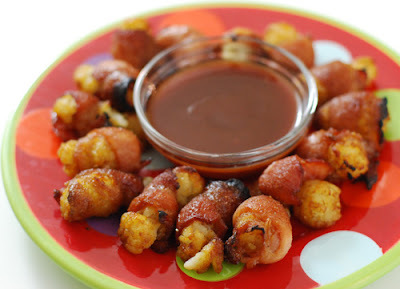 That is a tater tot wrapped in bacon. I knew I would save it for a party for boys. When the UFC fight party came about I knew I had to do these. Unfortunately I no longer have a link to where I orginally found it. So I had to figure it out on my own. 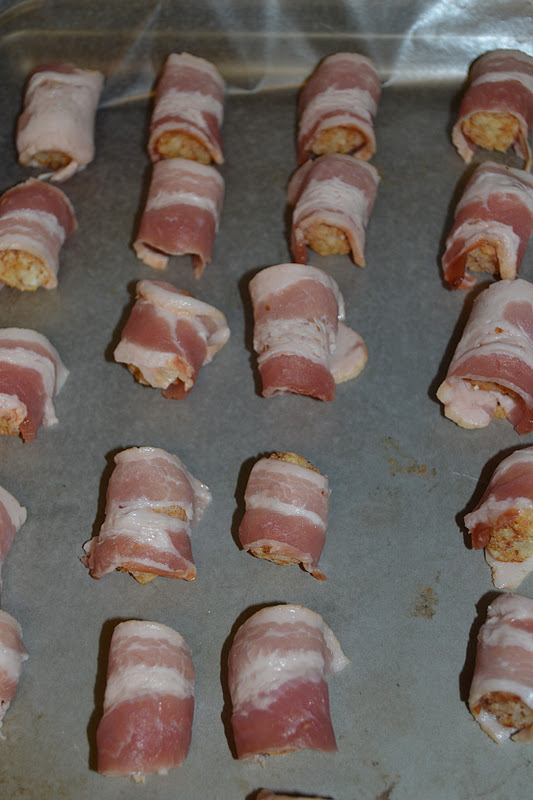 So I chopped up the bacon in small sizes. Sorry the bacon picture is lame, I was in a hurry. 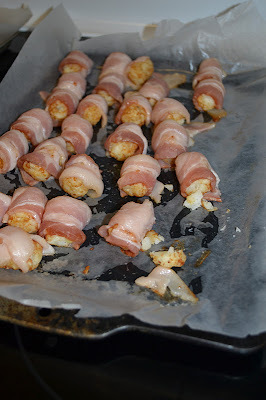 Then I wrapped the bacon around a frozen tater tot. I popped them in the oven at 450° for around 30 minutes. Oh no. There's that darn wax paper again. The wax paper that is not supposed to go in the oven. I just quickly moved them to another sheet and kept on baking. They turned out amazing! Don't drool too much. We dipped these bad boys in ranch. I only had a few because they probably have 3,456 calories a bite. But those few special bacon nuggets blew my mind. If you make any of the recipes you find on this blog, please make these. The last action shot just makes me weep. Well done. This is exactly what I was hoping for and you Nailed It. Can't to try this, oh, and I will. So glad you were happy with the bacon post. I'm telling - this will change your life. Make sure you eat this with others around. You may have a heart attack if you eat the whole thing yourself. Let me know it turns out! Thanks for reading!